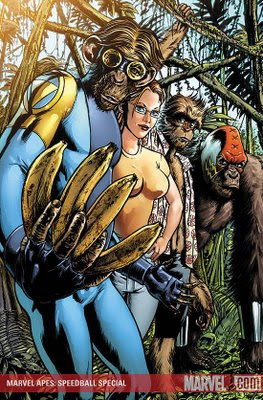 Marvel Apes: Speedball #1 is out and it has the first part of the Darwin Story I penciled. I thought it would be out in April under Marvel Apes: The Amazing Spider- Monkey but this will have the second part of the story. My bad! I didn't know until my friend Slade told me he picked it up. I was confused as to how he got a copy a month ahead of time, but after he called I did some googling and found out he was right! Must be nice having a comic store in town. Anyhoo, I did not do the art for the cover. It was masterfully done by John Watson. I'll post some of the pages to wet your appetites soon, but in the meantime go pick up your issue today! Chad, please post some of your upcoming amazing artwork for THE WARLORD #3. Thanks! I'd love to but can't due to ND's (or Non-Disclosure Agreements). I’ll be sure to post some artwork when its out though. Thanks for the complements!